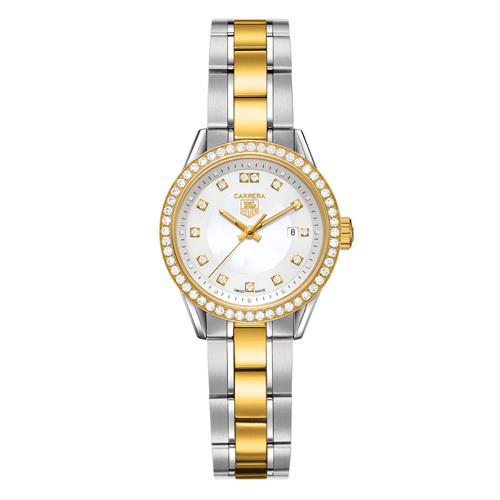 The Tag Heuer name evokes a sense of reliability and durability, as well as elegance, and their ladies’ watches seem to keep these feelings in tasteful balance. The most seamless balance is in Tag Heuer’s Carrera WV1451.BD0797 watch for women, which effortlessly maintains the brand’s rigid standards of performance quality alongside delicate materials and incredibly feminine details. The Carrera collection was created in 1964 to celebrate the Carrera Panamericana Mexico Race, an epic sports car race along open roads in Mexico. Jack Heuer captured the sleek design and precision gears within a sports car and displayed them with phenomenal grace in the original Carrera watches. Today, the Carrera collection remains a timepiece of epic design, seen best in the Tag Heuer Carrera WV1451.BD0797. A mother of pearl face in either pink or white rests at the center of a round, glimmering face. Thirteen gold and .10 karat diamond squares (two at the twelve o’clock position) mark the hour within a ring of minutes. The watch hands are gold-toned, and the luminous hour and minute hands allow for perfect time telling at night or underwater. The date displays just to the left of the three o’clock hour marker. Framing the mother of pearl face is a fixed bezel of 18 karat gold set with fifty-four diamonds, each at .5 karats. The 18 karat gold continues along the bracelet band surrounded on either side by stainless steel. The push button clasp has double security, yet is easy to remove when desired. Other efficiency features include a sapphire crystal that is resistant to scratching, Swiss-quartz movement, and the ability to resist water down to a depth of fifty meters. Tag Heuer crafts two variations of the gold WV1451.BD0797. WV1413.BA0793, which is stainless steel throughout along with the mother of pearl face, and WV1412.BA0793 with a black face and all stainless steel on bezel and band. Priced at $5000 (with significant deals through online retailers as low as $3,500) this watch might be a little too flashy for your tastes. If so, explore Tag Heur’s other Carrera ladies watches like WV1450.BD0797 or WV2212.BA0798 for more subtle glamour, and the WV1415.BA0793 for the epic Carrera with no diamonds at all. Other styles and variations might not be available in the two-toned design, however. The 18kt gold and stainless steel combination makes this an extremely versatile accessory that can be worn with gold or silver-toned jewelry. A truly exquisite watch that you simply cannot ignore. How much is the cost of this watch? Where near Barrie Ontario is a dealer?